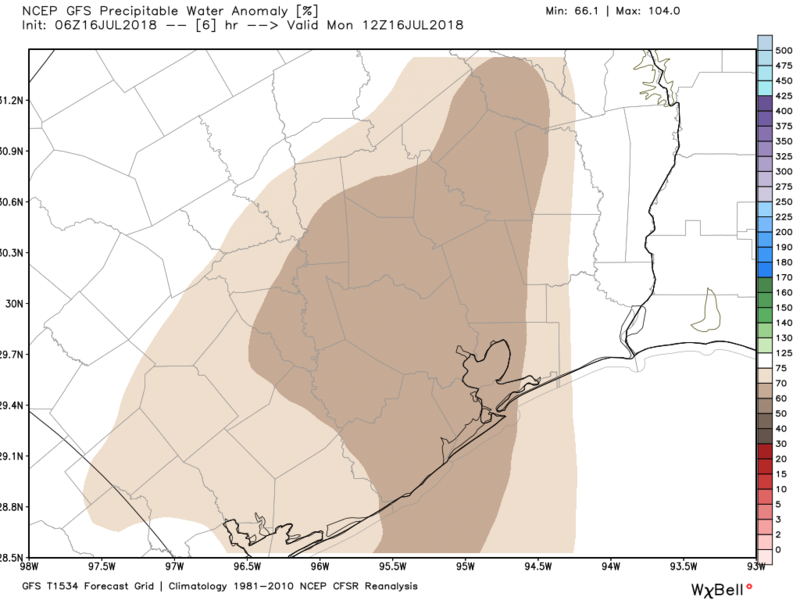 Houston has had a moderate first half of July, with an average high temperature below 93 degrees, and overall temperatures slightly below normal for this time of year. That is now about to change, as we shift into the mid- and upper-90s, virtually no chance of rain, and full-on summer. We hope you like it hot, because hot is what you’re going to get. 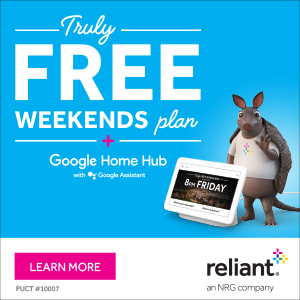 Remember all those clouds and healthy rain chances last week? Yeah, they’re pretty much gone. During most of last week the amount of moisture in the atmosphere, typically measured as precipitable water, was quite high as we saw values 50 to 100 percent above normal for this time of year. But this morning the tables have turned, with precipitable water values only about 50 to 70 percent of normal levels. So rain chances are going to go way down today, and go pretty much away for quite a while. Skies today should be partly sunny with highs in the mid-90s. What you probably will notice is a fine, yellow haze. That’s the Saharan dust that will be with us for the next few days. It will at least make for some pretty sunsets. 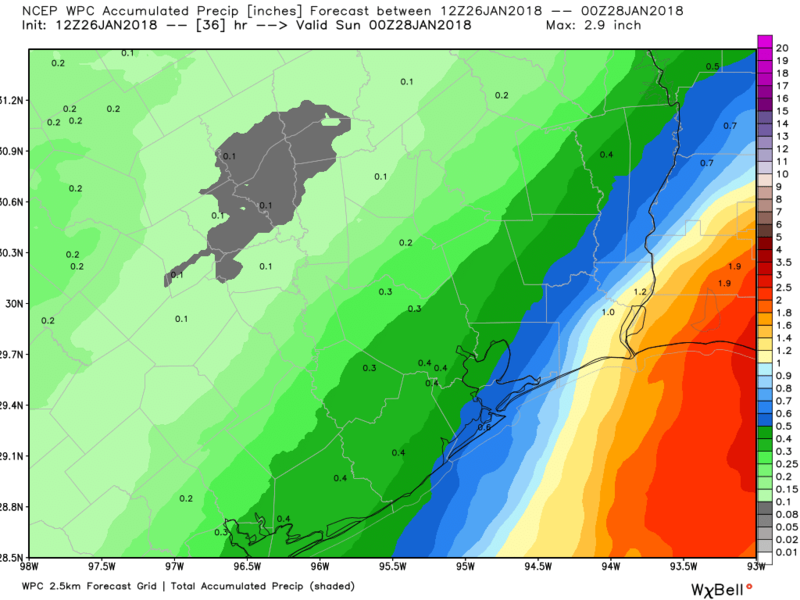 After a clear and cold weekend, our concerns once again turn to the possibility of a winter storm in Houston—the third time we’ve worried about this kind of thing during the winter of 2017-2018. Fortunately, I’m also pretty confident this is the last time we’ll have to worry about this for this winter. Fortunately, the inclement weather will hold off for today, allowing for pretty nice conditions across the region for the celebration of MLK Day. We can expect to see high temperatures in the low 60s, with partly sunny skies. Some scattered showers are possible later this afternoon and evening, as temperatures fall to around 50 degrees. Everything changes on Tuesday as a strong cold front blows into Houston between midnight Monday, and sunrise on Tuesday. Light rain should follow behind this front. We’re not concerned about accumulations, with only a tenth or two of an inch of precipitation for most areas. 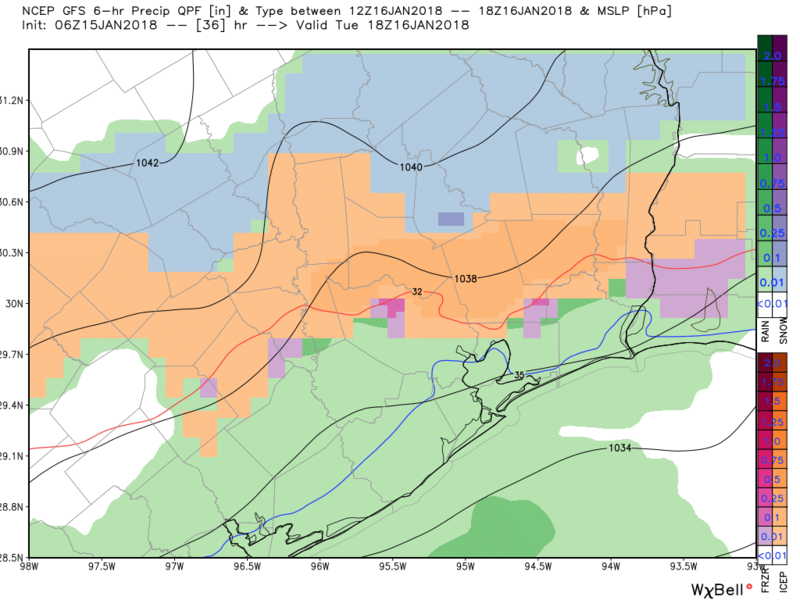 But we are definitely concerned about the potential for rain turning into a wintry mix north and west of Houston on Tuesday morning (i.e. 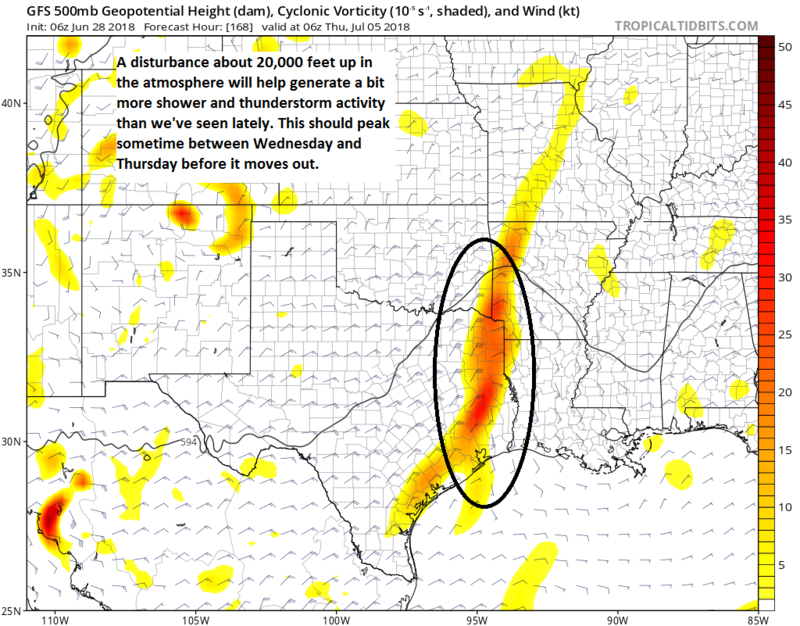 in the Brazos Valley and the Piney Woods regions), and moving southward into the Houston area later on Tuesday. Expect temperatures to fall throughout the day on Tuesday as very cold air advects into the region behind the front. 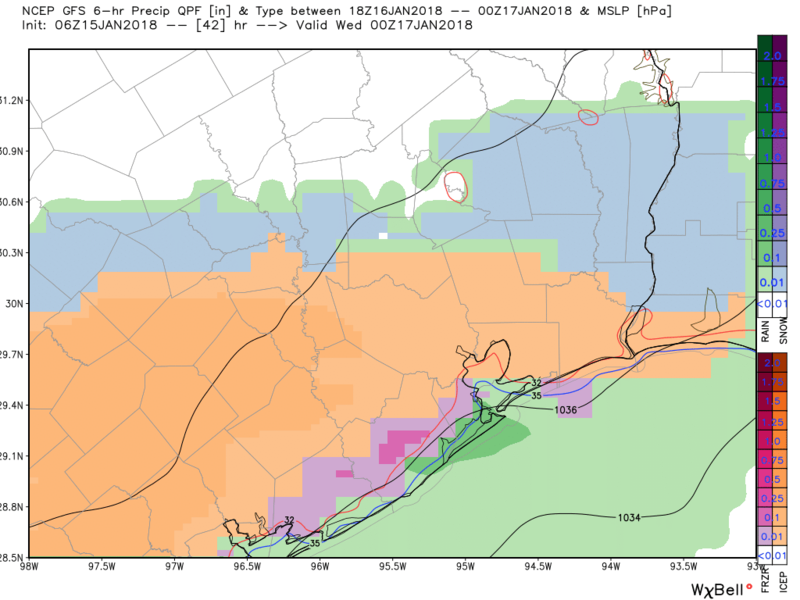 For Houston, we’re primarily concerned about precipitation that lingers into the afternoon and evening on Tuesday, when temperatures fall below freezing. Although the precipitation (rain, sleet, snow?) will be light, you’re going to want to check the weather and road conditions before venturing out on Tuesday evening or Wednesday morning. Overall I’m not too concerned as something like light sleet shouldn’t cause major problems. But we’re nonetheless watching this closely because of its trouble-making potential, and we’ll keep you updated. A winter weather advisory is in effect from 3am Tuesday until 6am Wednesday for the entire metro area. The other big story for Tuesday night is low temperatures. Right now I expect we’ll see low 20s for inland areas, mid-20s for central parts of the Houston area, and upper-20s for the coast. Obviously you should take similar precautions as to what you did for the cold snap right at the beginning of the new year.